Since I began writing about 3D films, and particularly since I began this blog, I’ve been trying to keep an eye on recurring themes, visual motifs and stylistic additions that might suggest an emerging consolidation of stereoscopic aesthetics in the new era of digital 3D cinema. In many ways this is an attempt to move beyond the popular discussions of 3D films that often reduce their unique aesthetic to a barrage of spears and other items flying at the audience. So far I’ve identified tendencies to use liquid fields (particularly when characters are submerged underwater), stereoscopic debris (small items such as shrapnel and dust motes fly around the screen space), vertiginous shots (often from the top of skyscrapers), and dynamic shifts between deep and shallow focus. It caught my attention that two recent films, The Martian (2015) and The Walk (2015), don’t just incorporate some of these elements but wholeheartedly copy tendencies in recent 3D films, specifically Gravity (2013) and The Young and Prodigious T.S. 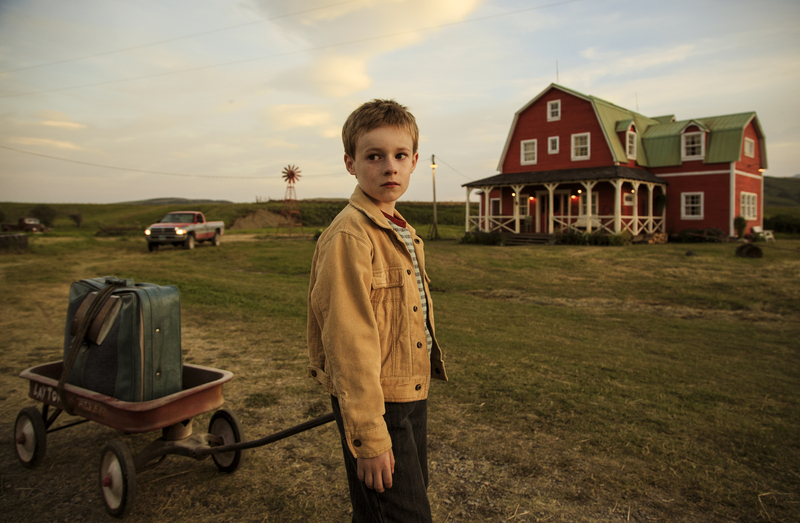 Spivet (2013). I’m less interested in whether or not this replication was intentional and more interested in what it says about commercial film industries that are developing stylistic tendencies that build upon traditional cinema modes as well as incorporate the new possibilities that stereoscopy brings. The closest comparison is between The Martian and Gravity. Even at plot level they are remarkably similar: in both films we begin with wise-cracking astronauts away from Planet Earth who are suddenly hit by a dangerous storm. In each case the protagonists of the films, Ryan Stone (Gravity) and Mark Watney (The Martian), are left to fend for themselves as they try to return home. 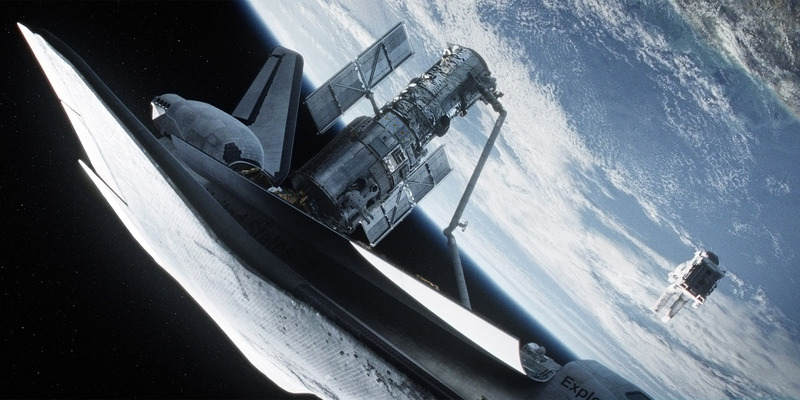 Both films have gained attention for their dramatic yet potentially realist depictions of space with scientists weighing in on whether or not the events in Gravity and The Martian are plausible. With regards to 3D, the initial storm allows for effective use of stereoscopic debris with parts of a blown-up satellite hurtling towards the characters and audience in Gravity and sharp fragments from the dust storm flying around the screen space in The Martian. The encroachment of this material into the auditorium is a more subtle use of negative parallax space that critics tends to favour, justifying it as a necessary part of plot and character development rather than a gratuitous display. Although both films have been complimented on their use of realist stereoscopy, they both cheat depth relations a little for dramatic vistas. The human eye tends not to perceive stereoscopic depth beyond a certain point, and definitely not at the distance of far away stars and planet. 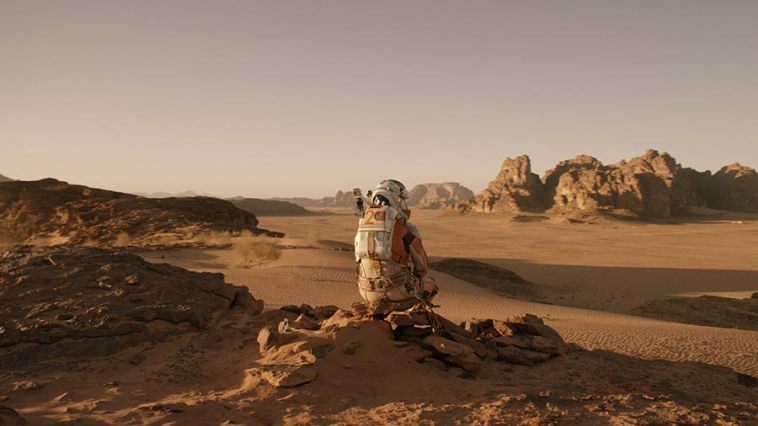 Nonetheless, The Martian opens on a starscape that is textured with modulating depth. In Gravity, Earth seems to have similar depth-rich surfaces even though these would not be visible from the character’s viewpoint in space. Again, it is possible to see how this use of stereoscopy fits in with the more conservative applications of 3D that high budget Hollywood films tend to aim for and critics prefer. The main difference in the use of stereoscopic visual fields in Gravity and The Martian is the latter’s frequent landscape shots. In the depiction of Mars we see an alien land, as yet undiscovered compared to the overly familiar Earth which hangs beneath the characters in Gravity. The long shots of the rocky red terrain remind us of the actualities of early cinema but it is now stereoscopic technology, rather than the novelty of moving images, which delivers the attraction. When the storm arrives, dust clouds roll down across the screen space in a way not dissimilar to the spectacular shots of a wall of water ready to rain down on Moses and his followers in director Ridley Scott’s last stereoscopic film, Exodus: Gods and Kings (2014). It is telling that Scott is able to build upon his own stereoscopic expertise as well as that of filmmakers going before him. Also worth noting is that The Martian has one sequence that is particularly unique. Although many 3D films have slow motion sequences, this is the first that I can remember to have a fast motion sequence. Occurring when scientists back on Earth are setting up an alphabet to emulate the one Watley places in front of the Pathfinder probe, the sped up motion has a distinct visual feel in stereoscopic depth. While the comparisons between The Martian and Gravity are obvious I think there also interesting comparisons between The Walk and the lesser known but arguably more compelling The Young and Prodigious T.S. Spivet. 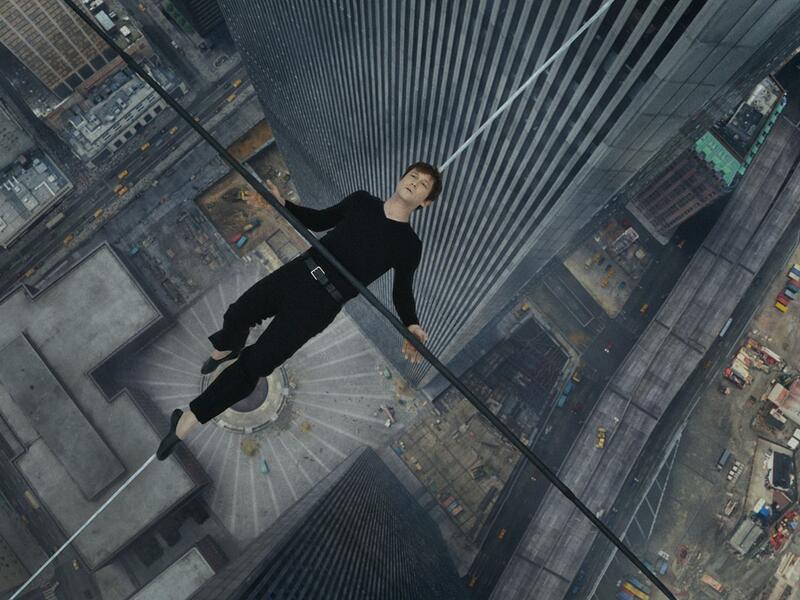 Whereas The Martian and Gravity aim for a realist aesthetic, The Walk and The Young and Prodigious T.S. Spivet deliver a hyper-expressive aesthetic infused with warm brown, and golden orange tones that suggest familiarity and nostalgia. In both films there is a journey of self development: the eponymous 10 year-old protagonist in The Young and Prodigious T.S. Spivet is on a quest to reach the Smithsonian Institute in order to receive a prize for his prodigious work on perpetual motion and Philippe Petit is undertaking an expedition to New York to walk a high-wire between the Twin Towers. The former is surrounded by spectacular images that go beyond narrative development such as the frequent depictions of pop-up book versions of the characters and settings. The depth relations of these visual caesuras appear more vivid in stereoscopy. Early on in The Walk we are introduced to Petit’s earlier self in Paris in the 1970s. The shots are mainly in black and white but, using a style in place at the end of Schindler’s List (1993), certain objects are washed with desaturated colour. They are most often objects in the foreground: the navy blue of police officer uniforms, the spherical candy that Philippe throws towards the cameras before it lands in his mouth. In these moments stereoscopy further highlights their place in the foreground and both 3D effects and colour rendering becomes more expressive than might be found in other commercial films. This expressive quality allows us to accept the way that Petit seems to be constantly speaking directly to us and performing for us. 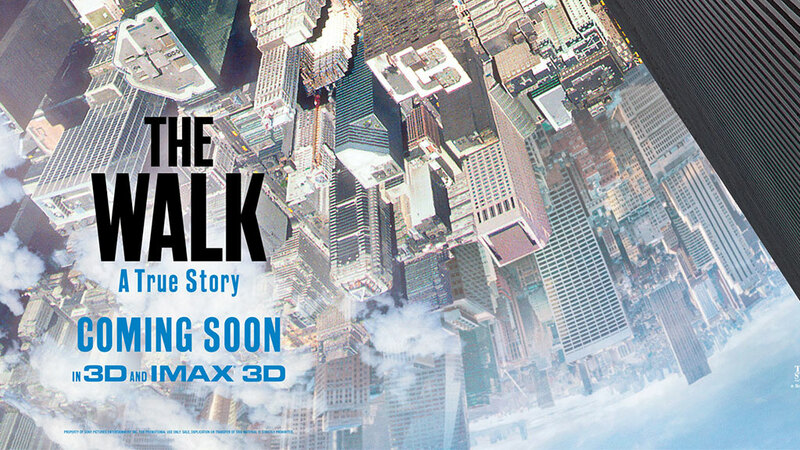 Drawing upon other 3D films set in urban locations, some of the strongest shots in The Walk are those that display the immensity of the skyscrapers. The first is an inversion of what we would expect: the cameras look up the Twin Towers rather than down them. As more of the action takes place at the top of the Twin Towers there are frequent opportunities to frighten us with vertiginous shots that look down their depths to the tiny streets below. What is strange, though, is the amount of artefacts such as ghosting and strobing that appear in a film that seems to have the budget and the aim to avoid them. The director of photography, Dariusz Wolski is no stranger to stereoscopic productions and is in fact the same director of photography who has worked on all of Ridley Scott’s 3D films including The Martian. Whether he has been supported by better stereographers during his work on previous 3D films or whether the design of the stereoscopic visual fields was taken out of his hands by the post-production company that converted The Walk to 3D, the result is much more disjointed and less fluid visual fields than in other recent Hollywood 3D films. It is a shame as it gives the impression of a slightly sloppy film that does not live up to the careful construction of The Young and Prodigious T.S. Spivet. The latter represents French director Jean-Pierre Jeunet successfully delivering a slice of Americana whereas The Walk represents a US director clumsily dealing with French protagonists. This is no more obvious than in the strange plot device that seem to be designed to accommodate the international cast and presumed English speaking audience. Petit supposedly wants to practice English, making his French compatriots speak to him primarily in that language. Although one of the other main characters, Papa Rudy, has been living and working in France for decades, his Czech background means the only common language he can find with Petit is English. These aspects are made all the more ridiculous by the poor foreign accents that the actors have. Regardless of the extent to which these films are more and less successful in their combination of narrative and stereoscopic visual fields, they each show the dramatic and expressive possibilities that contemporary digital 3D cinema can employ. It wouldn’t surprise me to see more repetitions of visual motifs and stylistic tendencies in the coming years but it also excites me to think, what will the next break-away style be?